Tuna Knobs: are they responsibly sourced? Twisting knobs on a touchscreen isn't a wholly unsatisfying experience, but what if you could actually stick real controls on there and turn those? That's the premise behind Tuna Knobs, a new product from Rotterdam-based design office Tweetonig, which is set to launch as a Kickstarter project next month. Designed for iOS, Android and Windows touchscreen devices, each Tuna Knob has a suction cup that sticks to your screen. Turn one of them and, thanks to the conductive silicon rubber, this movement is translated into a touch command. 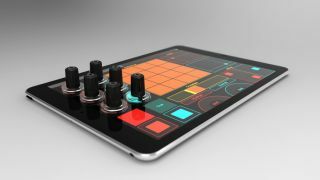 The developer says that the technology is not dissimilar to that of a touchscreen stylus, and compatibility is promised with most DJ and music making apps. The obvious question is whether you'd want to go to the trouble of sticking the knobs onto the screen in different places every time you open a different app, but the concept itself is interesting. Assuming the crowdfunding campaign is successful, the Tuna Knobs should be shipping by the end of this year.